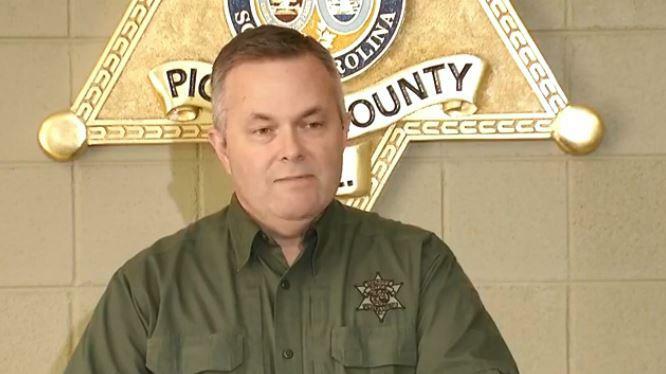 PICKENS, S.C. -- A South Carolina woman is being hailed as a hero after investigators say she fatally shot an escaped inmate who had kicked in the door of her home as she slept early Tuesday. Pickens County Sheriff Rick Clark says the inmate was one of two who escaped the Pickens County Prison as a part of a "premeditated plan" around 2:40 a.m.
Clark said the inmates assaulted prison guards before they fled the facility in Pickens, west of Greenville. Clark said officials received a 911 call less than 20 minutes after the escape reporting a sighting of one of the inmates, whom he identified as Timothy Cleveland Dill, on a road a short distance from the prison. Deputies responded about four minutes later and took Dill into custody without incident. During Dill's arrest, deputies received another 911 call from the homeowner, who said the other escapee — later identified by officials as 30-year-old Bruce Webb McLaughlin Jr. — had kicked in the rear door of her house and that she'd shot him with her handgun. The woman was home alone in her bedroom at the time. Clark said evidence at the scene supported the woman's statement to deputies that the inmate had kicked in the door, armed himself with a foot-long metal sharpening tool he took from the kitchen, and approached the door to the woman's bedroom, "just feet away" from where she had been sleeping. Clark said the woman, with no escape route, shot the intruder in the head. Clark said the woman had undergone firearms training and was licensed to carry a concealed weapon. He credited her for receiving the training and said it helped her save her own life. "This lady took the time to get a [concealed weapons permit] and set herself up to protect herself, and not be harmed, raped, or killed," Clark said. Clark said the intruder was a "big guy" and "if she hadn't had a weapon, there's no telling what could have happened. But she stopped the crime. She solved the crime for us, and she came out a winner." Clark said he gave the woman a hug and told her how proud he was of her. "Very few people, even cops, go through situations like that, and she's kind of a hero to us here today," Clark said. Clark said there was no prior relationship or connection between the woman and McLaughlin, whom he described as a felon "who had been known to us for quite awhile." Responding deputies found McLaughlin, still dressed in an orange prison jumpsuit, with a single gunshot wound to the head. He was immediately identified as the second escapee and was airlifted to a hospital, where he was pronounced dead. The homeowner wasn't injured. Clark said she wants to remain anonymous and asked the media to respect her privacy. McLaughlin had more than a dozen prior convictions on charges ranging from assaulting a police officer and pointing a gun to drug possession with intent to distribute, disorderly conduct and shoplifting, according to Pickens County Sheriff records. He was currently awaiting trial on first-degree burglary and grand larceny charges. The first inmate, Dill, had been held before the escape without bail on charges of criminal sexual conduct with a minor. He had also allegedly violated his probation on a 2016 burglary conviction. Dill, too, was awaiting trial, Pickens County Chief Deputy Creed Hashe told CBS News. The two inmates had plotted their escape for at least several days and possibly weeks, Clark said. The two prison guards who were overpowered, a man and a woman, were treated for minor injuries and were expected to make a full recovery. Clark said other inmates attempted to help the wounded guards. The sheriff's office says once the investigation of the shooting is complete, the case file will be forwarded to the 13th Circuit Solicitor's Office to determine any possible criminal violations. But a sheriff's statement said its preliminary conclusion is that the woman was protecting herself, and the department "has not uncovered any evidence or information that in any way would suggest probable cause of a criminal violation on behalf of the homeowner at this stage of the investigation." Several states, including South Carolina, have a "castle doctrine" that recognizes a person's home as their "castle" and allows them to legally defend themselves with deadly force while inside it when in fear of death or great bodily harm. South Carolina is also among the states that have expanded the legal concept to locations outside the home under controversial statutes sometimes known as "Stand your Ground." Clark said the incident was a "shining example" of why homeowners, especially women, should receive concealed weapons permits and training. According to the Bureau of Justice Statistics, home burglaries in which residents become victims of violence are relatively rare; a national survey found about 7 percent of household burglaries between 2003 and 2007 involved some form of violent victimization. Of those, the victims in most cases — 65 percent — knew the offender. Dill was charged Tuesday afternoon with additional counts related to the escape and officer assaults.